Recently Tesco went out in an Essential Retail article and defended legacy systems. “If you don’t have legacy, you are probably not in business”, said their CDO, Thomas Nielsen. So what would Vertica have to offer Retail if legacy is that good? In this webinar we’ll look at some of the strategic areas that are transforming retail, its operations, and its interaction with the ones who call the shots – the customers. The best use of Vertica in a retailer might not necessarily be to deploy it as a replacement for any of its siloed legacy systems, but rather to provide a means to explore, analyze and visualize insights derived from several of these legacy systems. This is exactly what Zoined, a Vertica OEM partner, does in its analytics offering. Zoined Retail & Hospitality Analytics is a cloud based SaaS product, which out of the box contains 90-95% of the metrics and KPIs used by retailers and hospitality operators to track and monitor their businesses, giving them support for smarter decisions and actions in key areas such as assortment, cross-sell and staff performance optimization, all in real time. 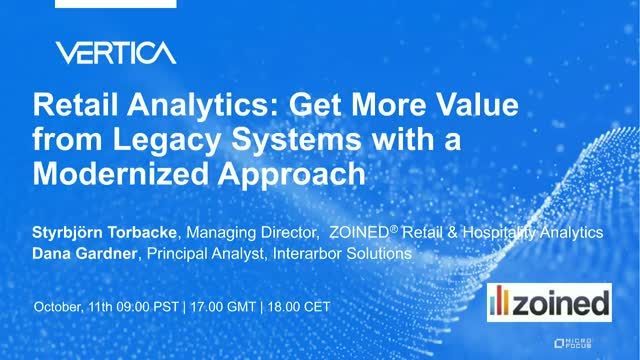 Styrbjörn Torbacke, the MD of Zoined will describe how Vertica allows them to combine, correlate and present operational insights in real time to relevant staff in a retail environment.